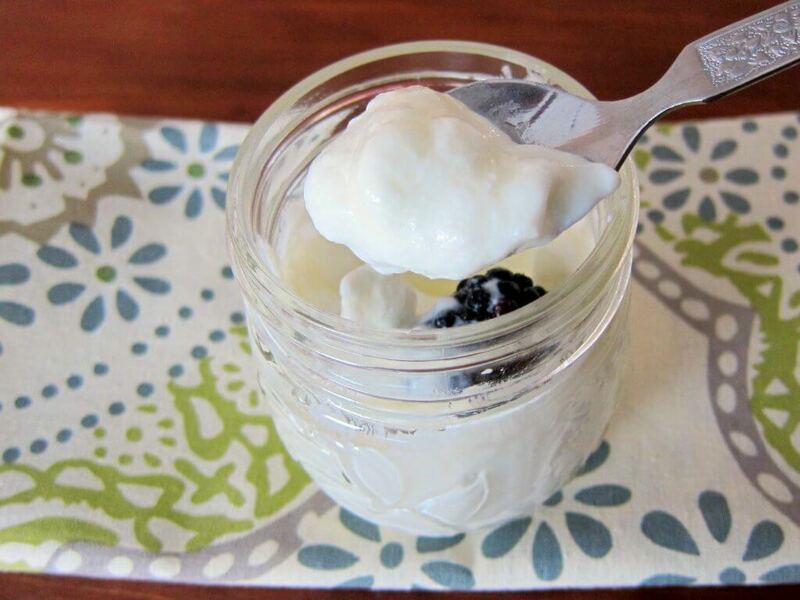 Learn how to make homemade Instant Pot yogurt in jars using the Pot in Pot (PIP) method. This Instant Pot yogurt recipe is free of additives and preservatives and is full of healthy probiotics, vitamins and minerals. It may sound weird to some people, but I LOVE plain yogurt, with no add-ins! And if you talk to anyone who’s from India or has grown up in an Indian family, you’ll probably hear the same thing. We eat yogurt as a side dish with our meals, and use it to make dishes including curries, sauces, desserts and drinks. 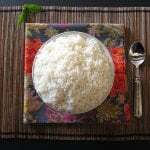 A favorite food of mine as a kid was just plain rice and yogurt – I just loved it! When I had an upset stomach, I was given yogurt. While growing up, I remember every Indian household made homemade yogurt every day, and that’s the case even today. My dad once told me that the yogurt active culture (starter) used in his childhood home was handed down through the generations! So, I’ve pretty much felt like a failure (as far as yogurt goes!) my whole adult life because I bought my yogurt in the grocery store and I didn’t have much luck making homemade yogurt. Instant Pot yogurt is smooth, creamy, all-natural and better than what I buy in the store. Another great thing is that I can use my own yogurt as a starter. Probably won’t be able to keep it going for a hundred years, but it’s a start, right? One thing I’m not sure about is how long my homemade yogurt will continue to perform well as a starter with active cultures. Only time will tell, and I’ll update this post if I find out anything new. Today I’m going to tell you how to make homemade yogurt using my Instant Pot Yogurt recipe that uses the pot-in-pot (PIP) method i.e. the yogurt is not made directly in the inner pot, but rather this Instant Pot yogurt recipe uses jars placed on a trivet in the inner pot. I like to use the PIP method because it’s more convenient. If I make the yogurt directly in the inner pot, then while the yogurt cools in the fridge, I can’t use my Instant Pot. Not good. Plus, I prefer to make my yogurt frequently, rather than make a big batch and keep it in the fridge for too long. The potency of the active cultures diminishes the longer you keep the yogurt. So the quantity of yogurt I can make using the PIP method in individual jars is just right for me. If you’d like to make a larger quantity of yogurt in the inner pot, try out this Instant Pot Greek yogurt recipe from This Old Gal. I do have a tip from my dad, who’s a food scientist. He tells me that if the yogurt starter loses its potency over multiple batches, just add a tiny bit of lime juice to the starter and allow it to sit at room temperature for a while. I haven’t tried this, but if you do, let me know how it turns out! I also have a tip from my mom: she uses a spoon and smears the inside of her jar or bowl with the starter. She says that doing this gives her really good results. For this Instant Pot yogurt recipe, I use separate jars, but you can just as easily use a larger oven-safe bowl that fits in the Instant Pot. If you’re using the larger bowl, use about 2 teaspoons to 1 tablespoon of starter for 32 ounces (1 quart) of milk. Make sure your canning jars or bowlare oven-safe. If you use something too thin, your milk can overflow or the container can crack. You’ll need a simple kitchen thermometer to measure the temperature of the milk. I use whole milk to make my Instant Pot yogurt recipe, and it comes out thick and creamy. You should be able to substitute 2% milk, but if you want to try out 1% or skim milk, make a smaller quantity (so you don’t waste milk) and see how it goes. You might need to add some nonfat dried milk. For the yogurt starter/culture, I use the Fage brand of Greek yogurt. Fage has a mild taste, but if you like your yogurt tangy, try and experiment with other brands. I use full-fat yogurt. I bring the starter yogurt to room temperature to allow the live and active cultures to flourish. If your sealing ring has a lingering odor, just remove the sealing ring during the ‘Yogurt’ cycle. The Instant Pot doesn’t come to pressure in the ‘Yogurt’ setting, so you don’t need it. I don’t make Greek yogurt (because I like regular yogurt better.) But if you want to make Greek yogurt, once the yogurt has completely chilled and set, strain it through a double-layered cheesecloth or coffee filter. If you’re new to the Instant Pot and aren’t familiar with how to use it, please read the Instant Pot DUO Beginner’s Quick Start Guide or the Instant Pot ULTRA Beginner’s Quick Start Guide first and then come back here to learn how to make Instant Pot Yogurt. Fill four 8 oz. canning jars with milk up to 1/2-inch below the rim. Pour 2 cups of water into the Instant Pot inner pot and place trivet in the inner pot. Carefully place jars on the trivet and close the Instant Pot. You can choose to cover the jars loosely with aluminum foil. Press ‘Steam’ and ‘+’ or ‘-‘ until display reads ’1’ (1 minute). The display will count down from ‘1’ to ‘0’ and it will switch to ‘Keep Warm’ mode and display ‘L0:00’. Carefully remove jars from Instant Pot. I just use the trivet to lift the jars. If you have trouble with this, use a mitt or towel to remove the jars from the Instant Pot. Or alternately, let the jars cool in the Instant Pot for a bit before removing. Let milk cool to a temperature of 110 degrees F.
Remove skin (if present) from the top of the milk and discard. Add 1/2 tsp of starter yogurt to each jar and stir well. Place trivet back in Instant Pot and carefully place jars back on trivet. The inner pot should already have water in it from the previous run. Place lids over jars ( but don’t screw in the covers.) This will prevent condensation from dripping into the jars. You can also use aluminum foil. Close the Lid. Sealing valve can be in ‘Sealing’ or ‘Venting’ position. It doesn’t matter because the Instant Pot is not coming to pressure in the Yogurt setting. Press ‘Yogurt’ and ‘+’ or ‘-‘ until display reads 8:00 (8 hours). When the 8 hours are up, the display will read ‘yogt’. Open the Instant Pot and move the jars to the fridge for a few hours. Add fruit, honey, cinnamon and brown sugar or any add-in of your choice. Remember to save a few teaspoons of your plain yogurt for the next batch. 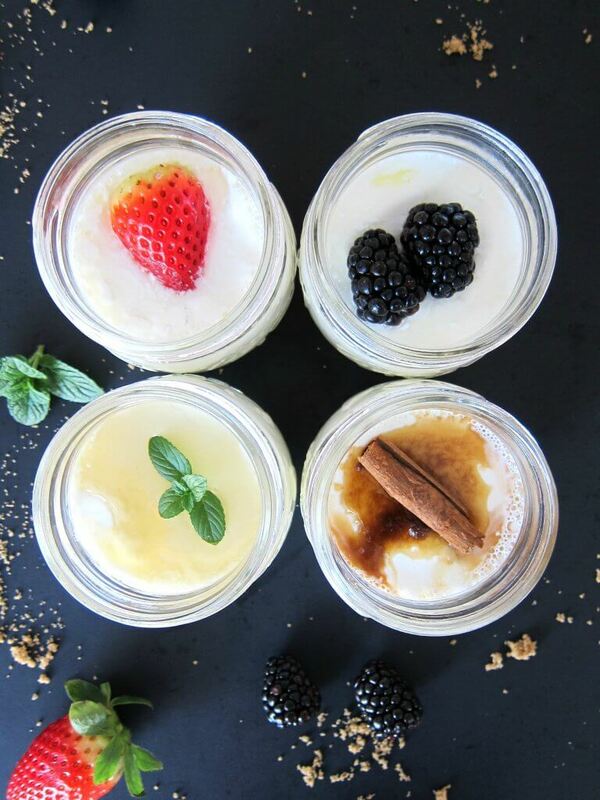 This homemade Instant Pot yogurt is free from additives and preservatives, and is full of probiotics, vitamins, calcium, protein and more. Pour 2 cups of water into the Instant Pot inner pot and place trivet in inner pot. Set Instant Pot to 'Steam' for 1 minute. Do a Quick Release to de-pressurize the Instant Pot. Open the Instant Pot and remove jars when cool enough to handle. Using an instant thermometer to measure the milk's temperature, let milk cool to 110 degrees F.
Remove skin (if present) from the top of the milk. Place jars back on trivet. Place lids over jars ( but don't screw in the covers.) This will prevent condensation from dripping into the jars. You can also use aluminum foil. Close the Instant Pot lid and set to 'Yogurt' mode for 8 hours. Open the Instant Pot and move the jars to the fridge for a few hours to chill. It's best (but not absolutely necessary) to take your starter out of fridge and bring it to room temperature. I used the full fat variety of Fage brand of yogurt. I have not found a need to sanitize the pot before making yogurt. If you wish to do so, just run a water test like you did the first time you used your Instant Pot. It is important to use canning jars or an oven safe dish. Remember to save a few teaspoons of your plain yogurt for the next batch. I love plain, full fat yogurt, too! My family eats a lot of it–we go through about 3-4 containers a week. I need to try this homemade version, I’m sure it would be very cost effective at our house! Thanks for sharing, pinning for later. Nice. I still do it the old fashion way. Go to mummy’s and raid her fridge. I haven’t even thought about homemade yoghurt in years but I can instantly remember it as a flavour of my childhood. I’m only half Indian but yes I love plain yoghurt too. And I loved the homemade yoghurt I used to get at home best of all. Thanks for a big food hug! It’s funny how living back in India, it was ‘yoghurt’, but here in America it’s become ‘yogurt’ for me. I’m glad that this brought back old memories for you! I’ve been a big believer in the health benefits of probiotics for a long time now but never thought to make my own yogurt! Thanks for a very detailed and excellent recipe! One less thing to buy from the store, and make at home. The 8 hour time can be scary but as you can see, the hands-on time is minimal. I love it – what a great story about your introduction to yogurt – thanks for sharing! I have the lux Instant Pot without the yogurt setting. Can I still use it to make this pip method? What setting would I use? Thank you for all the great info. Hi Becki – there is no equivalent setting for the Instant Pot Lux model. However, you might try this tip that someone’s used with success (but I haven’t tried it.) 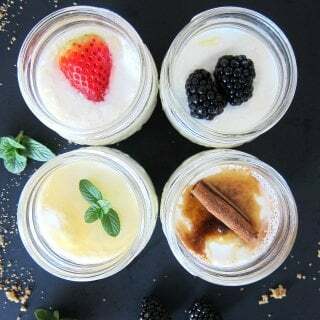 https://www.copymethat.com/r/3nkQVaG/yogurt-in-a-lux-instant-pot/ Good luck! Indian culture sounds similar to Hispanic culture. My mom would give me yogurt when I had an upset stomach too. Plus it’s great for sore throats! I love that you made your very own yogurt in the instant pot! Looks terrific! That’s really interesting that your mom did that too! Funny how different cultures of the world are more alike than different, right? I have pint jars and coconut milk yogurt for my starter. I plan to use cashew milk for my yogurt. With the larger jars (I can fit up to 3 in my IP) do you have any suggestions? Thanks! How did this recipe turn out ? I think to make coconut yogurt using c coconut milk or cream. Hat do you think? Love this idea! Quick question though: Is it okay to start with really cold milk straight from the fridge? I’m using glass canning jars and am afraid the sudden temperature increase in the Instapot will break the glass. Thanks!! Hi Grace – I used cold milk and had no problem. The yogurt was kept out for a bit. Make sure your glass jars are canning jars or oven safe -they will be thick glass – and you should be fine. Best of luck! I just used canning jars and after the steam for 1 minute step, I opened up my instant pot to find the jars broken… Just a heads up! Oh no! Did it happen to all the jars? I’ve never encountered that with canning jars (I use Ball or Mason brand usually), only with thinner glass jars that aren’t oven-safe. Learned the hard way. Some possible reasons: refrigerated jar, not using a rack, re-using jars from store-bought items like jelly, old jars, over-tightened lid. Could also be a manufacturer defect. Awesome recipe! Next time I’ll try it with a more sour yogurt. Hi Chelle — to make the yogurt more sour, you can let it sit in yogurt mode for longer than 8 hours. The longer the yogurt sits out, the more sour it gets. Try that next time. Thanks for taking the time to comment. Thank you for this yogurt recipe! Do you know if sour cream could be used instead as the starter yogurt? I don’t have any yogurt at this time. Hi Kam, I don’t think sour cream has the active cultures/bacteria that yogurt has. You’re probably better off buying a small container of yogurt. Good luck. Thanks for sharing detailed steps for making yogurt. I have question is 1 min steaming boils the milk? Other instant pot bloggers have mentioned to use boil settings to boil the milk. Hi Deepa – Those recipes are using the ‘yogurt’ button to both boil the milk and then allow the yogurt to set. Because my recipe is making yogurt in individual jars (pot in pot/PIP) I use the ‘steam’ and ‘yogurt’ buttons. The 1 minute steam does boil the milk if you’re doing the pot in pot with the small jars, as described in the recipe. Hope you get to try it out – and good luck! Hi, thanks for the great post. I have two questions. 1) Do you know if you can do this with 8 jars, maybe a rack between them? 2) You mentioned to remove the ring if needed for odors. Do you only do that for the yogurt setting part only or the steam too? You mentioned that it comes to pressure for 1 minute, so just wanted to make sure that I am doing it correctly. Hi Katie, I’ve not done more than four, but I have stacked jars for other recipes – so I think it should work, maybe fill a bit less, because the milk does boil. So for the steam part you need the ring. For the yogurt part you don’t. I don’t think the 1 minute will make your yogurt smell like curry or whatever, but you can run the sealing ring through the dishwasher, which reduces odors. Best of luck. Make sure your jars are oven-safe! Thanks for the great post. Question: Step 4 – steaming it for 1 minute. Did you check what this did to your milk temperature? Are you trying to bring it to 180F? Hi Buder – When I use the small jars as in the recipe, the milk boils in that 1 minute steam. But I don’t measure the temperature. Hope that helps. I have the (5) jar set for making yogurt in the instant pot. The jars a little smaller (between 5-6 oz). I assume that still leaving about 1/2″ from the top should work wit these? Also, do you think I need to change the time or the starter yogurt amount? I haven’t tried with smaller jars, Shayne, but you should be fine keeping the recipe as is. Good luck! Looking to make coconut yogurt using coconut yogurt for starter. Could I uses coconut milk for the milk? How do you think that would work? I’m looking for dairy free and low carb. Many thanks for the inspirational recipes!! Hi. What the shelf of this homemade yogurt in the refrigerator? I have not made it yet but plan to. I would be using the 4- 8 oz. Mason canning jars, 2% Fairlife milk and plain Fage yogurt. Hi Ken, I usually finish up my yogurt pretty quickly, but I’ve had yogurt in the fridge for a couple of weeks and it’s been fine. I’ve not used Fairlife, so I’m not sure about how it would be different. Good luck. I had one get a discolored spot after 2 weeks once. Scooped out the spot (and a good inch around it), and ate the rest. No consequences. I have a strong stomach though. I’ve been using pretty low grade Winco milk (and my own starter from previous batch), so found that if the milk is within a week (before) of its date I get a fun surprise during the steaming process — curds and whey! Not yogurt, but still tasty. Thanks Neena for the wonderful post. I enjoy ed the yogurt, andand it’s time to make more. When I click your link to the 8 oz jar I am confused about the variety of jars they offer. I am looking for a way to pack the most of 8 oz jars into my 6 qt Instant Pot. Are yours flat enough to pack another layer and make 8 yogurt at the same time ? Thank you again ! Hi Autumn – thanks for your question! The jars I link to in the post are the squat ones and no, they won’t fit in two rows. However, 7 of the taller skinny 8 oz jars will fit in the 6 quart. Like the ones in this brownie recipe. I hope that helps. I can fit to rows of 8 oz wide mouth jars. Maybe its a different size of instant pot? Next time I’m going to try the tiny 4 ozers –can fit 12 of those! You probably have the 8 quart? 12 small jars sounds very convenient! The highest label before “Max” says 4L, so I’m going to go with 6 quart. Two rows of 4 wide mouth 8oz worked well, as did the tiny ones. But, I find the tiny ones take a lot more work to put in, take out, add starter, clean, etc. And its often not enough yogurt to eat just one! So I went back to the bigger jars. The 8ozers get me about a 6 oz serving, but the 4s are like 2.5oz serving. I think a 4oz serving would be perfect. Having a golidlocks moment haha. Fun experimenting though! When you say “two rows” does that mean you are stacking them? Thanks for clarifying. I am getting ready to try this, am deciding what jars to use. Hi Jennifer, sorry about the confusion but yes, I mean to stack them. Hope you like it. Do you leave the water in the bottom of the instant pot? Sorry if that is a stupid question! Hi Shanna – not a stupid question at all. It’s a fair question since there is no pressure being used in the yogurt setting. You do not have to put water in the inner pot with the yogurt setting. I leave the water just because it’s already there from the ‘boil’ stage. Thanks for your question, probably helps others! In response to the question as to whether water is required during the “yogurt” portion of the cycle, in my experience the answer is absolutely yes. The water should probably extend at least part way up your glass jars, creating a waterbath. When I first tried with no water, the yogurt never got above 90F. With the waterbath the yogurt quickly reached the proper temperature of about 105F. Thanks for commenting, JB. I usually have water in the inner pot, but know of people who do it without water, but it was not from personal experience. Thanks for sharing. i read a few other techniques that mention straining out the whey, this recipe does not have to be strained? Thanks for your question. I never strain out the whey because I grew up eating it that way – it’s full of protein and minerals. Regular yogurt you buy in the store also has the whey in it. Those who strain the yogurt are looking to make a thick Greek yogurt. If that’s what you’re looking for, I have a link on the post where I link to another blog that shows you how. Hope that helps! If you press the steam button twice it will turn off the keep warm cycle. Hi Poonam, you should be able to follow the same directions and use your one container but just add a bit more starter (maybe 1 tbsp). Good luck, and thanks for your question. My milk boiled over! I have an 8qt pot, filled the 4-8oz jars with a little more than 1/2” of room from the top, 2 cups of water, 1 min steam… all kinds of foam and milky water at the bottom when I opened the pot. Thoughts?? Hi Summer – I use a 6 quart older model. I’m not sure what could have happened, but my first thought is that your 8 quart runs hotter. I hear people get burn notices more often with the newer Instant Pots. Sounds like you either need larger containers or need to reduce cook time to zero minutes (you can set cook time to 0). Hope you have better luck next time. I have the same issue. I’ve tried filling the jars less, bu t it still happens. Will try 0 minutes. Meredith, different models can be different, so maybe 0 minutes is a good idea. Hope it works better. Hi! I would like to try this recipe, but I have the 16 oz mason jars. 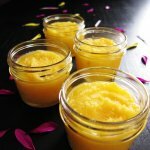 Would I have to modify the recipe at all to accommodate the larger jar size? Hi Ron, you should be fine using the recipe as written, except for the quantity of starter. I would add extra starter to the containers, maybe a teaspoon. Good luck! Was wondering if its really necessary to have the trivet at the bottom. Is it a problem if the steaming water is around the jars, or if the jars directly touch the metal bottom of the inner pot? If it wasn’t there I could fit more jars more easily, or possibly put the trivet between the layers for easier removal. Despite making lots of yogurt, in general I’m an instant pot newb so not sure what this would do. Also, the jars are covered during the steaming phase to keep out condensation, but does this matter during the yogurt-ing phase? Since there’s no water needed and not pressurizing, is there water to get in there? Meredith, I’m consolidating my reply into one comment 🙂 First of all, since these jars are glass, I wouldn’t recommend putting them in directly. I think it’s fine to keep the jars open while they are in the yogurt mode. I would be concerned about the jars going from cold to steaming – they might crack. Thanks for all your tips and info – they’ll be so helpful to others. Can you put some fruit compote on the bottom first and go through your recipe above? Hi Francine, thanks for your question. I’ve never done it, but I think it can be done if the fruit is room temperature, maybe even slightly warm. I would try it with one of the containers and that way you don’t waste in case it doesn’t work for you. I’d love to hear back from you! Personally, I only add fruit once it’s cooled. I wouldn’t try adding it during the cooking process. You don’t want to mess w/the cooking or culturing phase. Best and easiest recipe I have found. I cannot have dairy do you have recipe for soy yogurt? Sylvia, I don’t. I was able to see some recipes with a google search. Thanks for your question. I’m a bit confused. Twice you say the I-P doesn’t pressurize in the yogurt setting, yet on your instructions you also state “Once the Instant Pot is pressurized, the float valve will go up.” What am I missing? Sonia, you’re referring to the instructions for ‘Steam’. That does require the Instant Pot to pressurize. The ‘Yogurt’ setting does not require pressurization. Hope that clears it up. I can’t wait to try this! Simple and easy! Thank you! It is in the Yogurt setting now… hopefully it will be worth the hassle. Will try the 0 minute steam next time. Milk was super hot too (more than 200 degrees) while I think the boiling point for milk is about 180. I will post how it goes. The thought o pre-sweeten has crossed my mind too so that I don’t have to mix after and ruin the consistency of the yogurt but if you do that, you won’t be able to save some Yogurt as starter for the next batch. I guess we can leave one mason jar unsweetened. Robin, it’s a bit frustrating when different models work differently. I will put it on my list to try this out on my newer 8 quart. Give the 0 minutes a try next time and do let me know how it goes. Sorry for your troubles! It was my first time trying to do something like this, and it turned out wonderfully as far as I am concerned. 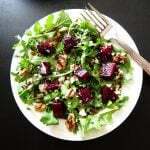 Taste is amazing and so easy and cost effective to make as well. Thank you for taking the time to share this with others, like myself. I’m pretty sure that I will no longer buy yogurt again, and get to enjoy freshly made from now on. Yesss! I hope you keep your starter going – I love that aspect of it. Thanks for your comment. Will 8oz Ball jelly jars work? I’m concerned because I googled it and it says that ball and Kerr jars are not oven safe. Lindsay, I can’t speak for other models than mine, but I use Ball, Kerr and Mason jars and have had no problems.